Situated at the old Traffic Police HQ are a cluster of pubs and good eating places. One of them is OTTO Ristorante. The place was always crowded for the excellent value-for-money (not cheap) executive set lunches. We went to this place almost 2 years ago for dinner (this article was based on that occasion), and numerous set lunches later, this place remains one of my favourite Italian restaurants in Singapore. In summary: Good Food, and Good Service. The F1 Degustation Menu was their specialty for the season. The chef was a F1 fan (no prize for guessing his Home team), and decided to come up with a salute to the once a year event that month leading to the F1 weekend. 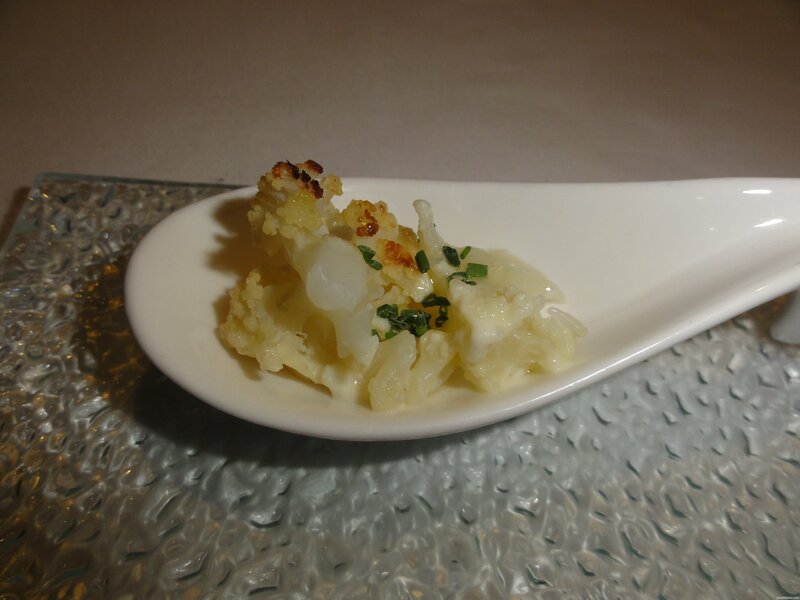 The slightly flamed cauliflower with Parmesan cheese started the evening. This dish made my princess to eat cauliflower ever since. You get the salty cheese taste of the Parmesan that matched perfectly with a piece of blanched cauliflower that was flamed to give that slightly burnt taste. Good start. 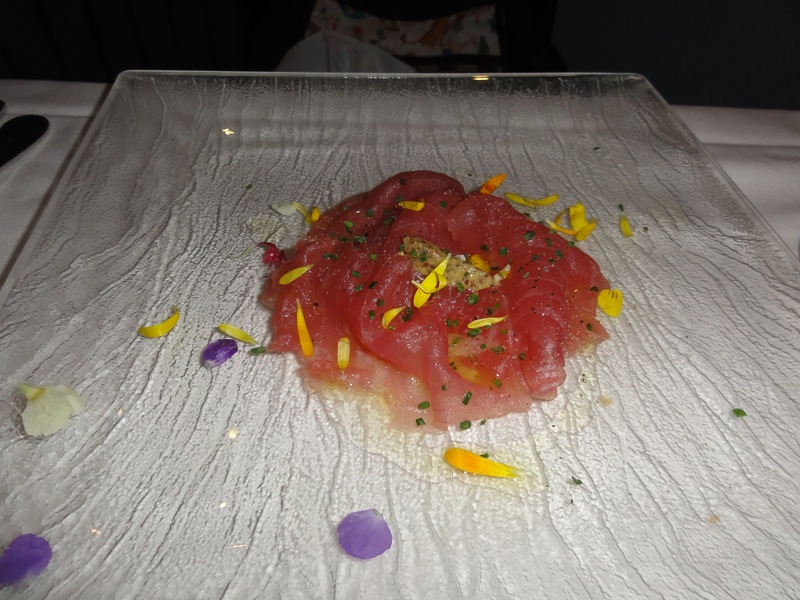 Next up, the sashimi dish – oops Red Tuna Carpaccio. Thinly sliced sashimi-grade tuna was place on a plate and drizzled with a mustard, lemon and olive oil concoction. No hint of green. Would be perfect if there was some rocket lettuce. 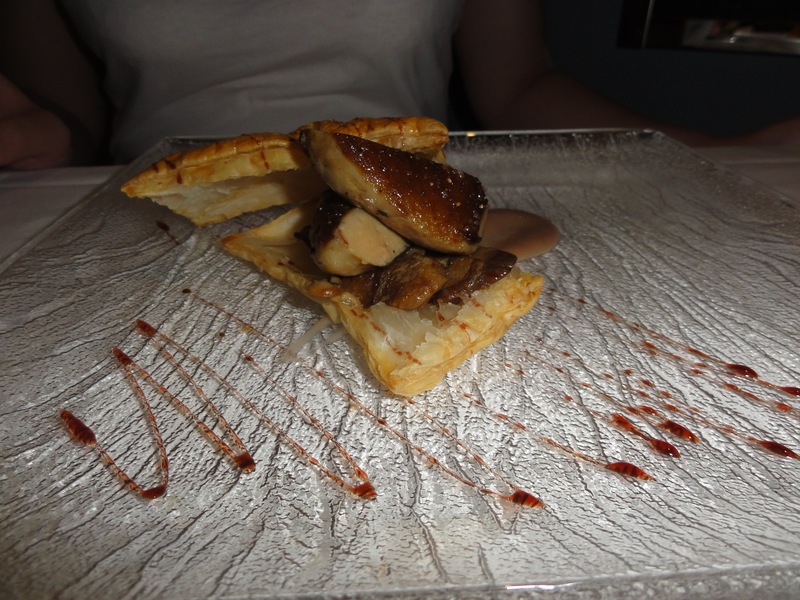 A play on the Foie Gas on toast, except that the toast was replaced with a mille feuille stuffed with mushroom. Look at it as a Mushroom Pie on Steroids. The degustation serving of the foie gras was much smaller than the a la carte (also shown in the slideshow), but no drop in the preparation. 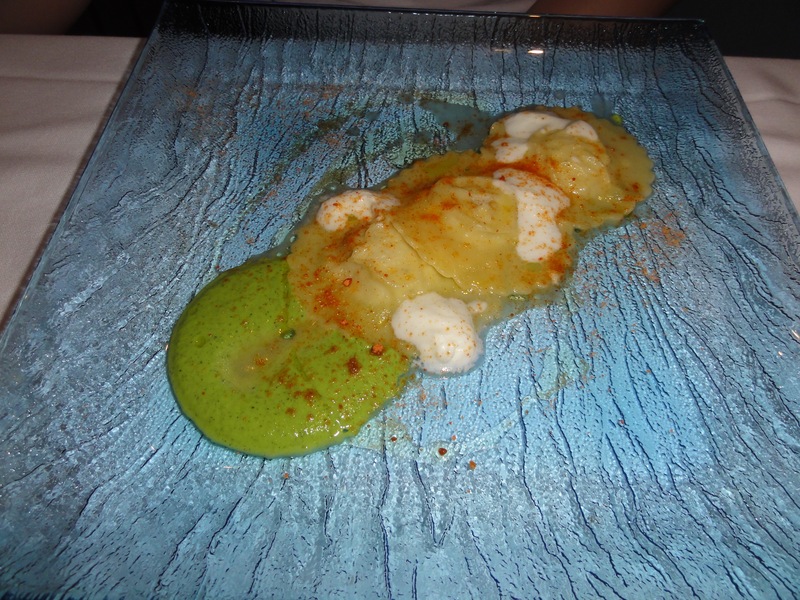 The pasta dish for the degustation menu was a Ravioli stuffed with Sea Bass served on a mashed zucchini and mozzarella paste. The description in the menu was much tastier. If I had to choose a dish I did not enjoy that evening, this would be it. First, I did not taste the European-esque origin of the sea bass. The mashed derivatives on which the ravioli sat did not compliment the ravioli. 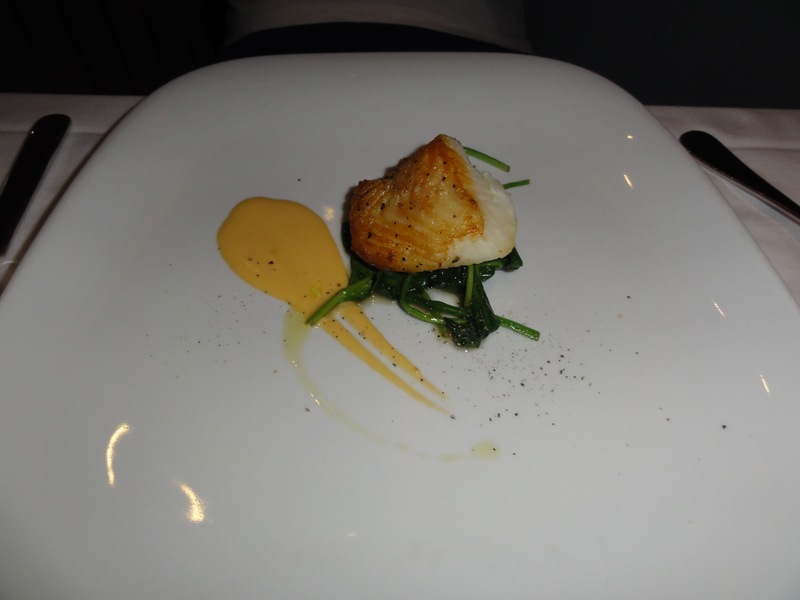 And this was to be followed by another fish that was much more oily and packed with flavour – the cod. Two fishes in one meal, not very creative. I would rather they served the spinach ravioli in consommé or the spaghetti with zucchini. They would still feature a pasta, and greens before we go into the main courses. The first Main Course was a delicately fried piece of cod served on a bed of blanched doumiao (pea shoots) with a creamy garlic sauce. The fish was oily and flaky, not overcooked, and rightly salted. Excellent dish. The Tenderloin was a bit overdone. As it was Waygu, we expected some less cooked than this. 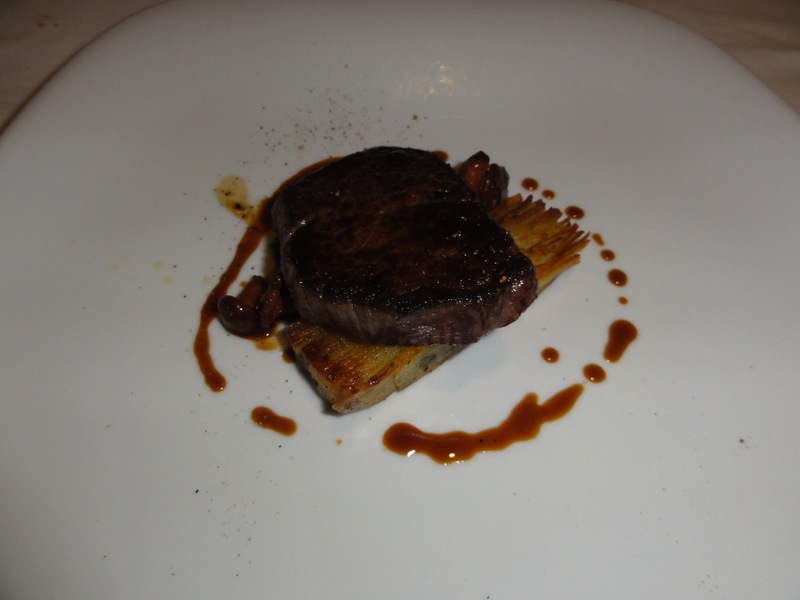 This is not the top notch Waygu – I suspect it was a A6/7 Australian Wagyu. Meaty, yes. Waygu, no. 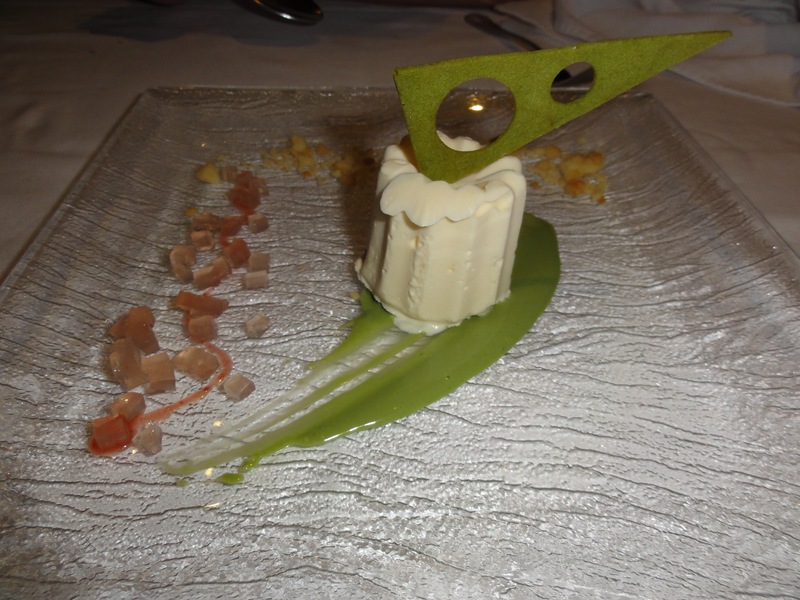 Desserts are sweet endings to a great meal, and this one did not disappount. From the jelly that gave a tartiness to the dessert, to the green tea sauce that gave the slight bitter taste, to the parfait of plain vanilla sugar overdose, this dessert was great with the coffee (espresso naturally). When I booked the table, they took the effort to ask if we were celebrating any special occasion. 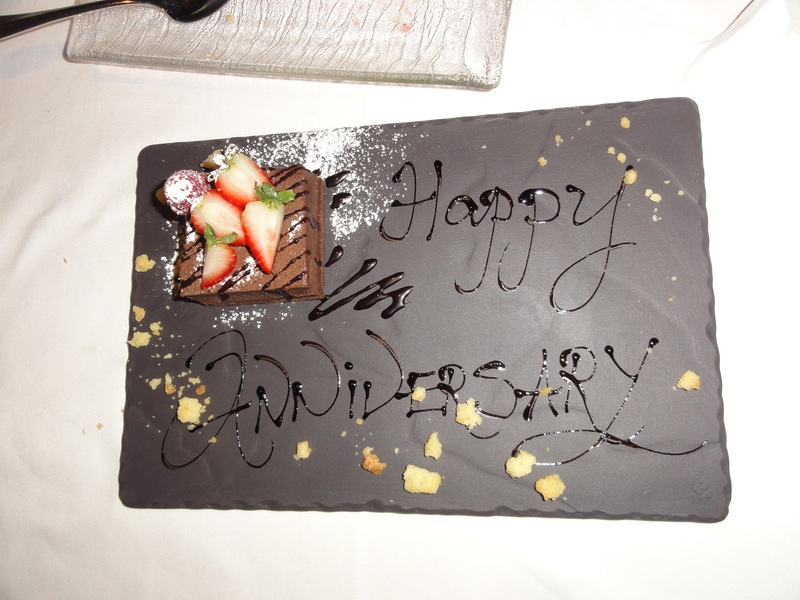 And as a special treat, they gave me a chocolate brownie as a special anniversary cake for me and my wife. How sweet. The whole dinner was well served at the appropriate speed. The service staff was attentive but not intrusive. Even the chef came and said hello because of the special occasion. No wonder they were awarded the Best Service Restaurant by Singapore Tatler in 2012. Another time, I was frantically organising a business lunch. They took my call at the very last minute, and managed to squeeze 6 seats for me. Even though we all had set lunches (approx $35++ pax), they still served us as if we were at the evening setting. Food: Excellent, 9/10. Must try the Crispy Suckling Pig and Foie Gras. Service: 10/10, fantastic every time. Makes you wonder why the rest could not keep up. Price: Pricey. Ambiance: Low ceiling makes this place a bit noisy at lunch time. Keep your voice to a whisper at dinner, the rest of the diners did that basic courtesy.